Most of the web pages do not fit on a single screen, so the ability to scroll information is taken for granted by all users. For front-end developers and UX designers, though, implementing scrolling experiences that work well across browsers, fit nicely into a design, and still perform well, can be a challenge. With web standards evolving faster than ever, coding practices often lag behind. Read on to revisit some common corner cases for scrolling and check if the solution you are using have been replaced with something more elegant. There is a system setting to make scrollbars permanently visible, and some people use it. In 2011, Apple’s interface designers, taking clues from iOS, had put a definitive end to all attempts to “beautify” a scrollbar. The ubiquitous design element had just disappeared from all Macs. It no longer takes any space in a static view, only to emerge when a user starts scrolling. 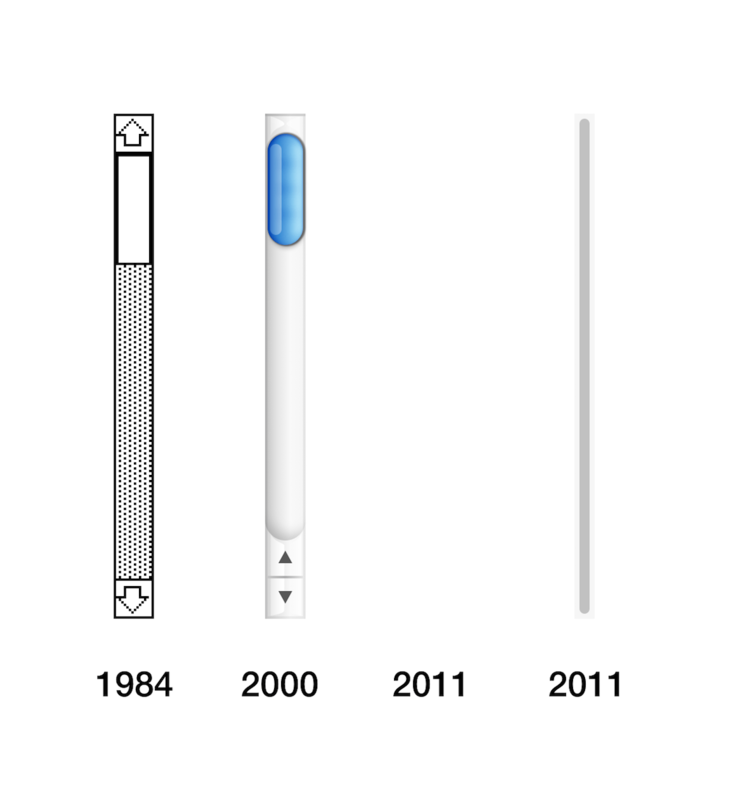 The quiet death of a scrollbar was never mourned by Apple folk. Users, grown accustomed to the way scrolling is done on iPhones and iPads, have quickly embraced the change and most of developers and designers have thought “Good riddance!” Accounting for a scrollbar width had always been a chore. However, we still live in a world with multiple operating systems and browser implementations. If you develop for the web, as we do, you cannot just push the “scrollbar question” aside. We are going to show you some tricks that can make a scrolling experience more pleasant for your users. But that code leads to an unpleasant jittery effect, captured below. In this example, a scrollbar on a Mac was forced to stay visible in System Preferences, for the sake of demonstration (and so we could relate to the experience of Windows users). How do we solve this problem? If we know the scrollbar’s width, we can add an offset on the right of the main page every time the modal window opens. Note that these measurements only concern the current versions of browsers under Windows. The situation used to be different in earlier versions, and no one knows how this is going to change in the future. That’s just seven lines of code, but these are lines of code interacting with the DOM. It is better to avoid DOM manipulations, unless absolutely necessary. The “jumpy modal problem” is solved, but you are stuck with a disabled scrollbar, which can be a visual sore in your otherwise perfect design. With Firefox, unfortunately, you are out of luck: there is no way to get rid of a scrollbar. As you can see, there is no silver bullet. Every approach that we have described has its pros and its cons. Pick one that suits your project the most. But what if you want to customize an existing browser scrollbar? There is no common API, every vendor will let you do different things. These tweaks are supported on a desktop in Chrome, Safari, Opera, and even on mobile in UC Browser or Samsung Internet. Edge planned to implement it too, but three years after it is still on a backlog with a medium priority. To be fair, from the W3C’s standpoint, WebKit approach, albeit well-supported, officially does not exist. 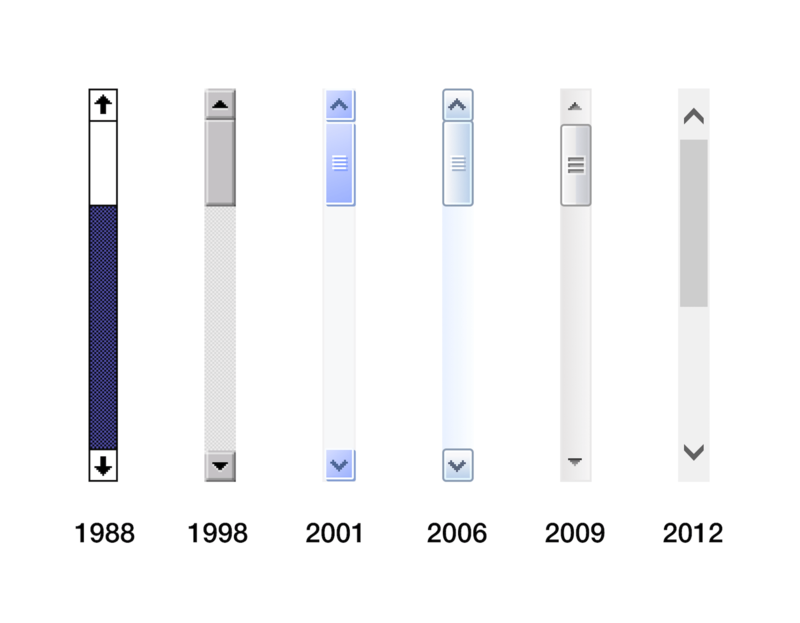 An existing draft for CSS Scrollbars specification takes hints from IE: customization stops at colors. The fight continues, with issues being open begging to support WebKit customizations. If you want to try to influence the CSS Working Group—it is high time to join the discussion. Perhaps, the issue is not the top priority, but the standardized support could make life easier for a lot of front-end developers and designers. But the browser support for options is still quite limited and it is still a script. And extra scripts should be avoided whenever possible. You can play with the property yourself in this codepen. As of this writing, scroll-behavior is only supported in Chrome, Firefox, and Opera, but we hope it will be universally adopted, as solving the smooth scrolling problem with CSS is much more elegant, and it fits better into the “Progressive Enhancement” mindset. Another common task is to position an element dynamically depending on scroll direction, the famous “sticky” effect. Of course, you are free to use ready-made implementations, as in Lodash. Check out this codepen to see a comparison between a solution described above and _.throttle from Lodash. It does not really matter which one you pick—just remember to optimize your scroll event handler in some way. Reflow is the name of the web browser process for re-calculating the positions and geometries of elements in a document, for the purpose of re-rendering it partially or entirely. The problem with this code is that every call to getBoundingClientRect causes a reflow and an overall performance takes a hit. It is even worse with these calls made inside of an event handler, and even throttling in this case is not of much help. Check out this cheat-sheet on DOM properties and methods that trigger reflow. This API is widely supported, but some browsers may need a polyfill. Still, even with a polyfill, it is the best solution so far. If you ever had to implement a scrollable pop-up or a drop-down, you must be aware of a scroll chaining problem: after you scroll past the end of an element, the whole page starts moving. You can get rid of an “overscroll” either by manipulating the overflow property of a page or by intercepting the scroll on an element and canceling the scrolling event whenever the element’s boundary is reached. Unfortunately, this solution is not very reliable. Also, it can negatively affect the performance. Overscroll is especially a menace on mobile devices. Loren Brichter has coined a “pull to refresh” gesture in his Tweetie app for iOS, and this trick has taken the UX community by storm: all major players, including Twitter and Facebook, have adopted it. The problem appeared when the same feature made its way into the Chrome browser on Android, which became a nuisance for everyone who implemented “pull to refresh” in their web apps: if you pull the page down, it causes a full refresh instead of loading more posts. CSS came to rescue with a new property: overscroll-behavior. 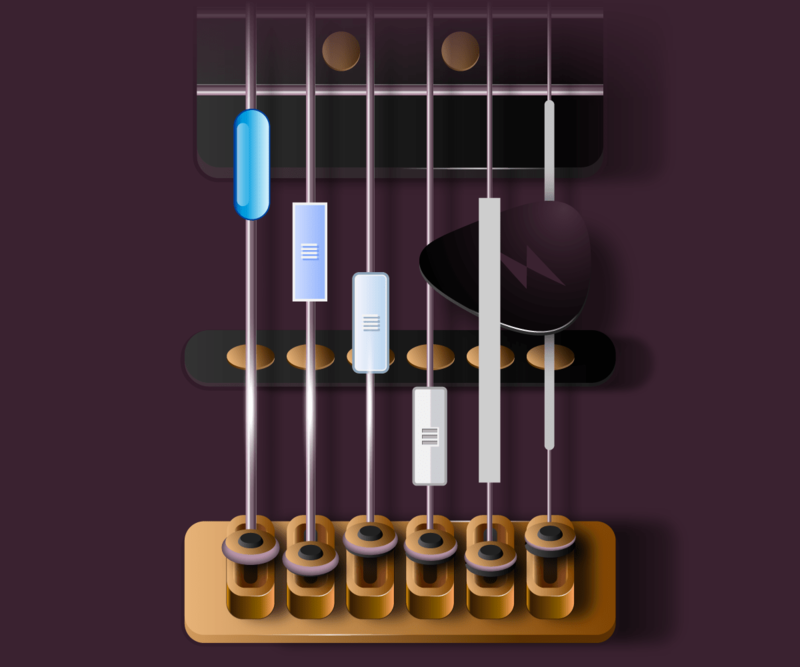 It permits to control the behavior on reaching the scroll boundary, dealing with both pull to refresh and scroll chaining, as well as with OS-specific special effects: Android’s “glow” and Apple’s “rubber band”. To be fair, Internet Explorer and Edge implement the -ms-scroll-chaining property which controls the scroll chaining, but it does not handle all cases. Luckily, according to this thread, the overscroll-behavior implementation for Microsoft browsers is on its way. Scrolling in touch-based interfaces is a vast topic which merits its own article. However, it deserves mentioning here, as a lot of developers tend to overlook the possibilities. The scroll gesture became so ubiquitous and addictive that people come up with crazy solutions to fight scrolling “withdrawal”. How often do you see people around you moving their fingers up and down across their smartphones’ screens? That’s right, it happens all the time, and most probably you are doing the same while reading this article. When moving your finger across the screen, you expect one thing: smooth, uninterrupted movement of content. “Momentum”, or “inertial” scrolling, pioneered and patented by Apple, quickly became standard UX everywhere and is now wired into our brains in a Pavlovian fashion. But perhaps you have noticed that while momentum scrolling of the whole page is handled for you by the mobile OS, it goes away when you try to scroll inside of an element on that page. For the mobile user, subconsciously expecting some inertia, it can be quite frustrating. Why is it a hack? First of all, it only works with a vendor prefix. Secondly, it only works for touch devices. And finally, if browsers don’t support this functionality, maybe we should just leave it at that? Anyway, there is a solution, and you are free to use it. Another point to consider while developing scrolling experiences on touch devices is the browser’s performance when handling touchstart or touchmove events. The problem is described in full here. In short, modern browsers, though knowing how to handle smooth scrolling in a separate thread, will still wait, sometimes for up to 500ms, for results of handlers placed on these events, to prepare for possible cancellation of the scroll with Event.preventDefault(). Even an empty listener that never cancels anything can have a significant negative effect on performance, as the browser still expects preventDefault to be called. There is also a polyfill to make up for browsers which are not supported. The effect of this improvement is clearly demonstrated in a video. If it ain’t broken, why fix it? In our opinion, Progressive Enhancement is the best approach to follow when implementing non-trivial scrolling in your web projects. Make sure you can provide the best possible minimal, but universally supported UX, and then improve with modern browser features in mind. Whenever necessary, use polyfills, as they do not create dependencies and can be easily removed once the necessary support has arrived. Six months ago, when this article was just an idea, some of the properties we have described were introduced only in a couple of browsers. By the time of the publication, they were almost universally supported. Maybe even now, while you were scrolling through this article, another browser has shipped support for a property that will make your life easier, and your bundle size smaller. Thank you for reading! Read browsers’ changelogs, participate in proposal discussions to move web standards into the right direction, and smooth sailing scrolling to everyone!